Laparoscopic adjustable gastric banding surgery, widely known as Lap-Band surgery, is a type of minimally invasive weight loss surgery (bariatric surgery) that involves placing a band around the upper part of the stomach to reduce the size of stomach and to limit the capacity of food intake. Gastric bypass, also known as Roux-en-Y gastric bypass, is a bariatric or weight loss surgery for obese patients who have not been successful losing weight through dieting, exercise and medication. The surgery uses a combination of restrictive and malabsorptive techniques to achieve a successful outcome. Staples are used to create a smaller stomach to limit the amount of food intake, and a large portion of the small intestine is bypassed to limit the nutrients and calories absorbed. The goal of the surgery is to make you feel full quicker so you don't overeat, and absorb fewer calories by the modifications made in the small intestine. Gastric bypass surgery has been shown to help reduce obesity and related illnesses, including heart disease, high blood pressure, and especially type 2 diabetes. It can be performed laparoscopically through tiny incisions (minimally invasive technique) or through a large open incision (open technique). Gastric Bypass surgery may be recommended when diet, exercise or medications have not helped in reducing your weight. Gastric bypass surgery is performed under general anesthesia. Your surgeon makes several small incisions on your abdomen. A laparoscope, a thin instrument with a light and camera on the end, is inserted through one of the incisions, allowing your surgeon to clearly view the internal organs on a monitor. Small surgical instruments are inserted through the other incisions to perform the surgery. The first step is to reduce the size of the stomach so that it holds less food. 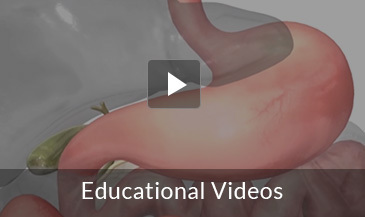 The upper portion of the stomach near the esophagus is converted into a pouch by stapling. The second step of the surgery involves the creation of a bypass for food to flow from the new stomach pouch. The small intestine is divided into upper and lower segments. After gastric bypass surgery, you will have to stay in the hospital for about 3 to 5 days. You may not be able to eat food for the first 1 to 3 days, after which you will be put on a liquid diet followed by pureed or soft foods. Follow an exercise program per your surgeon's instructions to maintain the weight loss. Gastric bypass surgery can help you lose about 10 to 20 pounds a month in the first year following surgery. You will gradually lose more weight by eating a healthy diet and participating in regular exercise. The surgery also helps you manage obesity-related health conditions. May be not all the individuals with earlier, unsuccessful bariatric surgery will be candidates for revision surgery. Revision surgery is associated with more risks than the first-time surgery. Your surgeon considers the probable risks and benefits and suggests you the appropriate surgery. Weight loss surgery is recommended when excessive weight is endangering one's health and diet and exercise fail to produce significant results. Endoscopic sleeve gastroplasty is the latest weight loss procedure carried out in a minimally invasive manner without making an incision. The procedure is performed under general anesthesia with the help of an endoscope (an illuminated tube with a camera) which is inserted through the mouth to the stomach. Live magnified images from the camera are displayed on a monitor and help your doctor carry out the procedure. The walls of the stomach are carefully examined and instruments passed through the endoscope are used to place a series of stitches on the stomach surface. When tightened, the stitches cause the stomach wall to fold giving it a sleeve like or tubular appearance significantly constricting the space within. The entire procedure takes about 60 minutes and you will usually be discharged home the same day. Following the procedure, the stomach's capacity to hold food is significantly reduced causing you to feel full earlier after a meal. The progression of food through the stomach is also slowed down prolonging your satiety and reducing your appetite. You may experience some abdominal pain, nausea or vomiting but these side effects usually last no more than 2-3 days. Complications such as bleeding and infection are rare. You will have to follow up with your doctor regularly to check your progress and identify any abnormalities. The stitches can be left in permanently with little to no complications but if necessary the procedure may be reversed. Occasionally stitches may give way due to overeating or vomiting making the procedure less effective. This can however be easily corrected. You will usually be under the care of a team of specialists including dieticians, psychologists and physical therapists to help you control your diet, improve your lifestyle and prevent weight gain. Restrictive - In the first part of the DS surgery, the outer curvature of the stomach is removed while the remaining stomach is shaped into a long, slim sleeve also known as a vertical sleeve gastrectomy. Unlike other gastrectomies, the vertical sleeve gastrectomy leaves the pyloric valve in place in order to control food movement into the small intestine removing the patient’s risk of dumping syndrome and other complications such as blockages and stoma closure. Malabsorptive - The malabsorptive component of the Duodenal Switch procedure involves rerouting portions of the small intestine in order to create two separate pathways from the duodenum to the lower portion of the small intestine. This technique reduces the amount of calories the patient’s body absorbs by limiting how long food can mix with digestive juices before being moved into the large intestine.